Harvey Prince was founded by two brothers as a gift for their mother. They craft inspired, high-quality fragrances, each with its own spirit and story. It began with a rebellious idea: boutique-quality scents should not be overwhelming, overpriced,and filled with toxic chemicals. Then came the inspiration: their mother, who loves honest products that feel and smell great. One Mother's Day, they crafted a scent that captured her effortless and radiant aura. 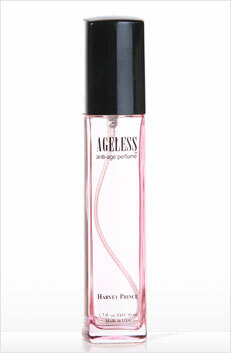 The result: Ageless, the first of their signature fragrances to take on the industry's usual cosmetics-counter fare. I got the chance to try out Harvey Prince's signature perfume called, Ageless. Right off, I was super excited to get the chance to do this review. I love perfume! Ageless is suppose to make you feel 10-12 years younger and the fact that when I first sprayed this, it immediately reminded me of perfumes I purchased when I was younger I say the guys over at Harvey Prince nailed it. I noticed a great deal of a floral notes like sweet pea (which I love), then I noticed softer hints of tropical fruit. The mixture of floral and fruity scents did make this seem like a younger type of perfume, not too strong or over powering and it didn't take over a room that I walked in, so again, the people over at Harvey Prince nailed the age-less part. The price for a full bottle is not out of the norm for perfume and I think it is well worth spending on, especially if you’re looking for something to make you feel younger and smell great. Disclosure: All opinions are my own. I received Ageless at no cost for the purpose of this review. No other compensation was received. A big thank you to Harvey Prince for providing the giveaway prize!